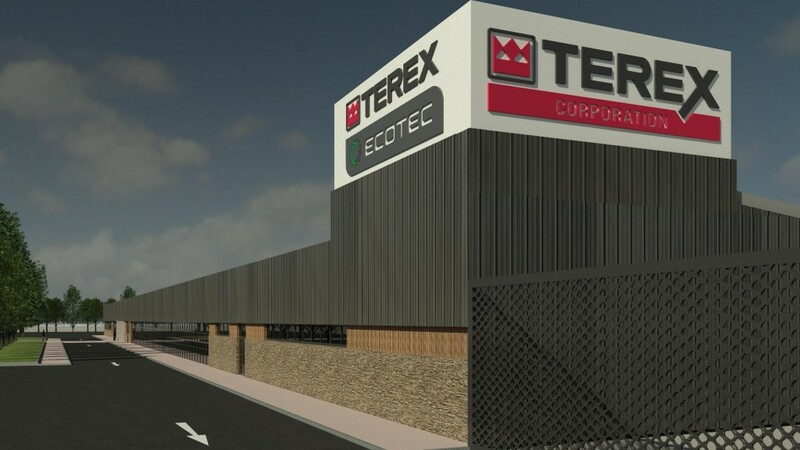 The new 105,000 square foot manufacturing facility will focus on the design, manufacture and development of Terex® Ecotec (waste management and recycling) and Terex Conveying Systems (TCS) (mobile conveying) product lines. Speaking at an announcement at the Guildhall in Derry, Kieran Hegarty, president of Terex Materials Processing, said, "As part of our growth strategy, we continually review markets to identify potential opportunities. The waste management, recycling and mobile conveying sectors are areas of significant growth and our objective is to be recognised as a leading global manufacturer in these areas. Our Terex Campsie facility will enable us to realise this ambition." The Terex Ecotec product line has grown significantly since it was established in 2014 as a strategic response to meet the specialised needs of customers in the growing waste management and recycling sector. The Terex Campsie facility will focus on developing advanced waste management and recycling products and services for Terex Ecotec customers with the goal of becoming a global leader in the industry. Terex Conveying Systems was established to respond to increasing demand for mobile conveying systems which, as well as being complementary to existing core Terex Materials Processing segment crushing, screening and shredding equipment, will help enable Terex to enter the port and terminal industry. The mobile conveying range is designed to offer a number of advantages to traditional wheel conveyor systems, including being cheaper to run, improved efficiency, a reduction in production costs, less of an environmental impact, improved health and safety and improved product quality. The Terex Campsie facility will manufacture four new products in the conveying range and will facilitate ongoing product development. Work is already underway at the Terex Campsie facility and is planned to be operational later this year. The facility will initially create approximately 100 new jobs that include production operative roles, management and support roles in HR, operations and finance, as well as a highly skilled engineering team that will be trained to leverage the Company's cutting-edge engineering capabilities and lead the development of Terex Ecotec and Terex Conveying Systems product portfolios. Hegarty continues, "Our investment of this size in a new facility will support our ongoing growth and development as we seek to build on the momentum of increased demand for our products globally." Work is already underway at the Terex Campsie facility and is planned to be operational later this year.